A stunning performance by runaway winner War Command in the Coventry Stakes made it four wins from four for Irish trainers on the opening day of Royal Ascot. The son of War Front was completing a double on the day for the team behind Queen Anne Stakes winner Declaration Of War, namely trainer Aidan O’Brien, part/owner and breeder Joseph Allen, and the Coolmore triumvirate of Messrs Magnier, Tabor and Smith. However, O’Brien’s son Joseph finished unplaced this time on favourite Stubbs, and it was another Ballydoyle stalwart, Seamie Heffernan, who rode the winner. 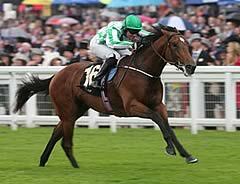 In third was another O’Brien runner, Sir John Hawkins, the mount of Ryan Moore. Allen, who lives in Florida, but is visiting Royal Ascot with his wife Annette, said: “This is surreal – it could not get better than this. I did not expect the first winner [Declaration Of War] because he was so disappointing on his previous run in the Lockinge Stakes, but this is a horse I have always liked. War Command was given quotes of 5/1 for next year’s QIPCO 2,000 Guineas by Coral, and 10/1 by Ladbrokes . “We wouldn’t have beaten the winner anyway but Tony (Hamilton, jockey) thought he was better for another two or three lengths.” continued Fahey “In race riding you make a decision and decide who the fancied ones are and you go that way Today it didn’t happen. “He is entered in several large two-year-old sales races and it would be hard not to run him in them. “I nearly pulled him out of his last race (soft-ground maiden at York, his only other start.) because of the ground – this is more his going.